Tony's Talking Pictures Blog: New in Theaters March 21, 2019 "Us"
A family's vacation is interrupted when a group of look-a-likes terrorize them. 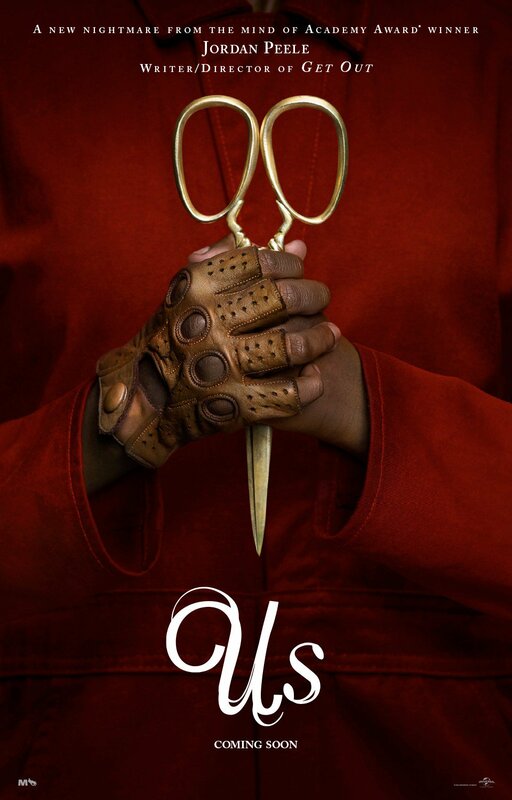 “Us” is director Jordan Peele's second foray into the horror genre. His previous film, “Get Out,” was a bonafide masterpiece and obviously there was a lot of pressure, either self imposed or fan based, to repeat that success. Unfortunately lightning doesn't always strike twice in the same place, and the result is the film “Us” simply is not on a par with his first film. That being said, “Us” is a thriller and a creepy movie audiences will ultimately enjoy, but it lacks an empathetic connection with the audience as the film unfolds. “Us” tries to create a foreboding atmosphere with a lot of night scenes and dark places, but comes off desperate, gratuitous and pandering. Lupita Nyong'o's performance is the best thing about the film. But even as devoted as she is to her character, she cannot save the film from a confusing and over-produced script. In the end, “Us” suffers from its own excesses and leaves us with a run of the mill 'slasher' film instead of the white knuckle ride we expected.